Miller & Zois handles large truck and tractor-trailer personal injury crash cases not only in Maryland but throughout the United States. Why do lawyers and clients in other states reach out to us for help? The main reason is our law firm has a history of seven-figure settlements and verdicts at trial. We know these cases, and we know how to put them in a position to win. To contact us about your situation, call 800-553-8082 or get a free online consultation. Truck collision cases are complicated. Many attorneys like to pretend like they are the same as any other case. But that is nonsense. If you want to win a truck accident case and maximize the value of the claim, there are things unique to truck accidents that your lawyer needs to know. These are some questions you might have about how much your case is worth and where your case is going? Who will pay my medical bills after a truck accident? How do you hold the truck driver and trucking company responsible for the harm and injuries they have caused? Will I get a larger settlement in a truck accident case than I would for the same injuries in a car accident case? How do attorneys in Maryland handle truck accidents versus other motor vehicle accident cases in Maryland? Can I sue the truck driver's trucking company for my injuries from the crash? I was injured in a truck crash where a big-rig truck jackknifed. Does this mean the truck driver was negligent? What’s the difference between a car and truck accident case? Are the differences significant? Who can sue in a truck accident injury or fatal truck accident in Maryland? I was seriously injured. The accident was the truck driver's fault, but my injuries were made worse by the fact that I was not wearing a seatbelt? Does this hurt my case? Are trucking companies regulated by the law in Maryland? My accident occurred in Washington, D.C. but I live in Maryland. Should I hire a truck accident lawyer in Maryland or a truck accident lawyer in Washington D.C.? If I am partially at fault for the accident, can I still prevail in a claim against a truck accident case? Are trucks required by the law in Maryland to carry insurance? Is it more difficult for trucks to brake? My daughter was rear-ended by a tractor-trailer, but the truck driver claimed my daughter caused the truck accident by backing up into him. How does Maryland law determine who is at fault? Is there a requirement as to how much insurance truck drivers must have? Responsibility for a truck accident lies with the driver who made the mistake which caused the crash. Maryland law defines what drivers, namely car or truck drivers, may do on the roadway. Often in car accident cases, Maryland law reflects your intuitive responsibility of who is at fault. In truck accident cases, there are specifics about the crash that are particular to truck accident cases and that make determining liability a bit more nuanced. Still, the most significant battle in truck accident cases is over damages. Trucking companies and their insurance companies and lawyers want to take advantage of you in these cases. They want to pay you far less than your claim is worth. At Miller & Zois, we have had cases referred to us by inexperienced lawyers where the offer was multiplied by ten just after we entered the case. The reality is that there is a small universe of truck accident lawyers who regularly handle these cases; just like there is a small universe of lawyers defending these claims. We all know each other. If your lawyer has the respect of the trucking company and its lawyers, there will be an impact on how they value your claim. There is no question that the best truck accident lawyers are going to get more for their clients in these cases. For many victims, the first question is where will the money come from to pay for all of these medical bills. This kind of emergency causes financial hardship both in terms of medical bills and in terms of lost wages. Some medical bills and lost wages will often be paid through your own insurance policy in Maryland. But, these policies are usually quite small and cannot cover all of your medical bills. Ultimately, the medical bills will be paid out of the settlement or verdict that you receive. The problem for victims is that your bills are owed long before your case is ripe for a settlement. What do you do? Our lawyers use our contacts and our ability to persuade healthcare providers to wait to get compensated out of any settlement. This tactic can be challenging and tedious to implement. But it works far more often than not. Pressure. As we said, often in these cases, the question is how much to pay. The trucking company and its' insurance company want to pay you as little as possible. These companies need to know that your lawyers are coming after them and are going to fight and fight until you get full compensation for your injuries. Many truck accident lawyers talk about getting you what is fair. We want to do better than fair. We want to get you as much money as we possibly can for what you have endured from this crash. The average settlement for the same injuries is higher in a truck accident case than in a car accident case. Why? Three reasons. First, trucking company insurers do not typically have in-house counsel to defend claims. They pay more to avoid having to engage in prolonged litigation and in a trial. Trucking companies and their insurance companies are also just used to bigger numbers and therefore, they do not flinch as much as auto insurers at significant settlements. Finally, trucking companies are often embarrassed by the accident and their conduct and know that it reflects on them as a business. This is particularly true if the aftermath of the crash reveals that the driver is not properly trained or did not comply with state and federal trucking safety regulations. How do lawyers in Maryland handle truck accidents versus other motor vehicle accident cases in Maryland? 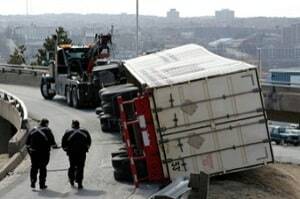 There are four considerations attorneys must consider in Maryland truck accident cases that are specific to the handling of trucking cases: (1) Maryland and federal regulations that apply to trucking companies, (2) the types of claims that can be brought against the trucking companies, (3) the nature of the investigation required by the truck accident lawyer, (4) the tactical jurisdiction issues regarding the most appropriate venue for the injury victim, and (5) the manner in which many truck accidents occur as specific to semi trucks and other large commercial vehicles (e.g., the problems associated with turning). The importance of hiring an attorney who is well versed in these issues is unbelievably essential. In most truck accident cases in Maryland, yes. It depends on the relationship between truck driver and the trucking company. If such a relationship is demonstrated, the company can be held legally liable for the truck driver's negligence under a legal theory known as respondeat superior, which means that the agent is responsible for the principal. The trucking company may also be liable under the theories of negligent entrustment or negligent supervision if they failed to screen adequately drivers they knew or had reason to know would untrained or unsafe truck drivers. You would be stunned how many commercial semi truck operators, particularly big rig trucks, are inadequately trained or have driving records that demonstrate they should not be behind the wheel of any vehicle, much less a commercial truck. There can also be a claim for negligent maintenance. Usually, a truck jackknifes because of the truck driver's negligence, often because the driver locked up the trucks breaks. Because a truck driver could theoretically jackknife without driver error, defendant's counsel will seek to avoid liability by arguing that the truck jackknifed because of due to the unforeseeable slipperiness of the road or because it had to take an emergency turn to avoid another vehicle. We have found that this argument can usually be defeated after a full investigation of the physical evidence. What’s the difference between the manner in which attorneys handle truck accidents versus other motor vehicle accident cases in Maryland? Although the rules determining fault for the accident are the same, there are special laws that apply to trucking companies. Other differences in the way in which Maryland attorneys handle these cases differently include the nuances of how the truck accidents typically occur, the types of claims that can be brought against the trucking companies, the nature of the investigation required by the truck accident lawyer, and the tactical jurisdiction issues regarding the most appropriate venue for the injury victim. But, to be sure, the biggest mistake you can make is thinking that it is just a glorified car accident case. Nothing could be further from the truth. Your truck accident lawyer in Maryland can bring a lawsuit on behalf of anyone injured or has had a loved one killed in a fatal truck accident. I was seriously injured in a truck accident. The accident was the truck driver's fault, but my injuries were made worse by the fact that I was not wearing a seatbelt? Can the truck driver's lawyer use that against me at trial in Maryland? Yes, there is a complicated statutory scheme that governs the trucking industry. Click here for more information about the background of these statutes. There are many potential places to file a lawsuit in this type of situation. You must consider the best venue given all of the factors, such as which jurisdiction has a cap on damages, the reputation of the juries in a particular jurisdiction, convenience of the injured party, the attorney's subpoena power over the witnesses, and a whole host of other factors. Your case may be filed where the trucking company is incorporated or does regular business, or where the trucking accident occurred. We often engage in battles with the trucking companies over which jurisdiction is the most appropriate for the case. In Maryland, you cannot recover if you are partially to blame (called contributory negligence). In many other jurisdictions, under a legal theory called comparative negligence, the amount of truck driver and the trucking company would be liable for the percentage of fault a jury attributes to their negligence. Yes. Commercial vehicles traveling in interstate commerce must carry $750,000 of insurance for bodily injury and property damage. Maryland also imposes the same limit for trucks traveling within Maryland. Unquestionably. Compared to cars, the stopping distances for trucks are much longer, particularly 18 wheel trucks. The Large Crash Causation Study (LTCCS) conducted in 2005 by the Federal Motor Carrier Safety Administration (FMCSA) and the National Highway Traffic Safety Administration (NHTSA) found a correlation between the size of a truck and the likelihood of a rear-end truck accident. Consequently, our attorneys handle a great deal of rear end big rig truck accident cases where the truck driver was simply unable to stop the truck in time to avoid crashing into the passenger car in front of it. On roads that are wet and slippery, there is an even greater disparity between the braking capabilities of passenger vehicles or motorcycles and large trucks. Failure of the trucking company to properly maintain their brakes aggravates the problem. Over 53% of the trucks causing wrecks had least one brake safety violation, accordingly to one study of fatal truck accidents, as opposed to only 30% of struck trucks (that were not at-fault for the truck accident). The usual culprit in these truck accidents is due to braking complication from brakes being out of adjustment. The black box often yields essential information that can help us prove liability on summary judgment even before the trial begins. My daughter was rear-ended by a tractor trailer, but the truck driver claimed my daughter caused the truck accident by backing up into him. How does Maryland law determine who is at fault? In Maryland, there is a presumption of negligence in a rear end truck accident. In other words, the law assumes the rear-ending truck in this case was negligent unless the truck driver's attorney can proffer evidence that shows that your daughter was at fault for the accident. In this situation, the truck driver's attorney has the burden of proving that your daughter backed up into the truck driver that, in most cases, is going to be tough for the truck driver's lawyer to show because accidents of this kind so rarely occur in this way. In the 1950's, it was a common practice for trucking companies' attorneys to advise them to use independent truck drivers to immunize the trucking companies from liability. Must have been awful back then to get so badly hurt and be turned away because someone set up some nifty corporate shells to hide behind. But, eventually, Congress passed legislation to ensure that the public was at least somewhat protected. Accordingly, liability insurance is required for trucking companies to make sure there is adequate insurance to pay for damages in truck accident cases. We have the experience to sort through these complicated issues and stand up to the insurance companies to fight for fair compensation for the victims of truck accidents. If you have been injured in a truck crash accident, select here or call 1-800-553-8082. Do I need an attorney in every truck accident case? In car accident cases, we tell people that there is an argument to be made that you might want to at least consider handling your case without a lawyer if your injuries are not significant. In truck accident cases, you almost invariably want to engage a lawyer because the value of the cases varies so wildly and there are so many things that need to be done to secure the evidence in a truck accident case. Does your firm handle truck accident cases? Miller & Zois handles truck accident cases in Maryland. There are no statistics on this, but; we think our law firm handles more serious injury and wrongful death truck accident cases than any firm in Maryland. Many of these cases come from other lawyers who refer these cases to us because they know that we specialize in these cases. Is your law office near me? Our truck accident lawyers are located in Baltimore. But if you are anywhere in Maryland, Pennsylvania, or Washington, D.C., our lawyers will come to you. If you have a severe injury truck case, you do not want to choose your attorney based on geography. There is too much at stake. You want to find the very best accident truck accident attorney you can find.